Futsal Youth Cup 2004 kicked off the first round on April 20, with youngsters flocking to join the competition. 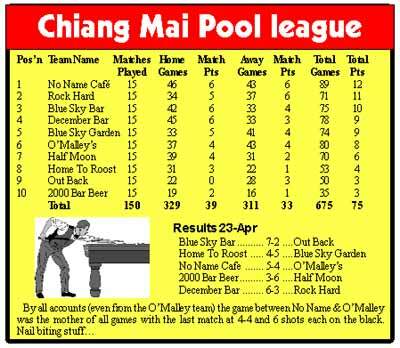 They are competing for a trophy from HRH Princess Ubolratana and a prize money purse of more than 40,000 baht. Organised by Dontree Season Company, it is part of the anti-drugs campaign. The JKR team (in red) was victorious over Don Pean (in gray shirt) 4-1. Draws were held, according to age. The under-12’s were subdivided into four groups of four teams each. The 12-14 year olds were divided into eight groups of three teams each. Cheerleaders from Srithana Commercial College. The first under-12 match, between the Don Pean team and JKR, was played on the same day, with JKR winning 4-1. Games were played every afternoon until April 26. At the launch, the organizers also announced the winner of the design competition for the Futsal Youth Cup 2004 logo. The prize went to Teerawat Lookin, with two honorable mentions given to Teerut Boonma and Bancha Udpoh. Despite the tremendous heat there was no way to keep the employees of Amari Rincome away from participating in their third Sports Day. The motto of the day was, ‘anything is better than working’ and the volleyball battle was further enhanced by general manager, Wim Fagel who changed the long existing rules a little bit. Volleyball players with GM Wim Fagel in their midst. He said that this sports day was not to discover untapped talent in the staff, but he saw it more as a staff motivation day, where colleagues meet in a different environment, rather than in their respective departments. The rule change for the April Volleyball tournament was that all teams had to be mixed. Three girls and three boys and on top of that, they had to come from different hotel departments. This was quite a challenge for people who are used to sticking together, but was a great way of team building and motivation. The enthusiasm was as audible as it was visible from the first minute of the first game, even if it was quite obvious that some saw their mission more in playing the drums on every available box or trashcan within 50 meters. 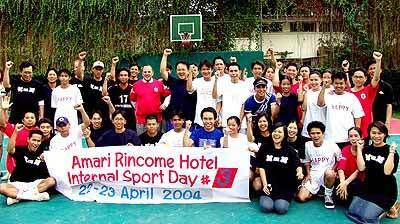 But in June when the official Sports Day of the Thai Hotel Association will take place, we might just have a new Amari Volleyball Championship team competing! The Chiang Mai Disabled Center received a donation of 51,250 baht raised by warm-hearted runners who took part in a Hash House Harriers charity run last month. Kiwi, Peter and Sandy, representing runners in the Run for the Disabled, hand over 51,250 baht to Mongkol Chompookrot, the manager of the Disabled Center’s workshop, flanked by Nitchanun Yodya and Don Willcox in front of the Chiang Mai Disabled Center workshop. The run organizers, Kiwi from the Fish ‘n Chips shop and Sandy Cullen from UN Irish Pub, together with Peter Vanhoo representing all the runners, made the presentation at the center’s workshop. The run was held in the Tambon Mae Hia area in Chiang Mai’s Muang district. Over 60 runners each paid a 500 baht participation fee which also covered a sumptuous dinner at the UN Irish Pub. 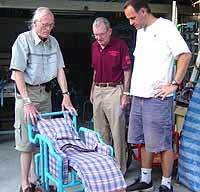 (From left) Don Willcox, Kiwi and Peter look at a wheelchair for disabled children, made at the centre. The Chiang Mai Disabled Center on Rajapakinai Road was founded by disabled polio survivor Susan Willcox and her husband Don, 11 years ago, while its workshop was established later to build wheelchairs for the disabled. The center manufactures its own wheelchairs that are given to children at no charge. The donation raised by the charity run will be mainly spent on producing wheelchairs and on wheelchair repair and maintenance. “The workshop at present has five mechanics to produce the wheelchairs, along with some volunteers,” said Nitchanun Yodya, the center’s physical therapist. Most of the wheelchairs will be given to disabled children with cerebral palsy in the Upper North and some areas in the Northeast. After delivering the wheelchairs, the center keeps in contact to check, repair and change their wheelchairs if the they become too small as the children grow. “The Chiang Mai Hash House Harriers have planned another charity run for next year. However, we are still looking for additional sponsors to support the event and more runners from both Thai and foreign companies and students to participate in a fun event that will give something back to society,” said Kiwi. The Summer Youth Sports event for young people under the age of 17 has kicked off under the “To Be Number One” umbrella. Kwanchai Wongnitikorn, deputy Chiang Mai governor, presided over the opening ceremony at the Rajabhat Institute football field on April 20. A group of basketball players at the opening ceremony at Rajabhat Institute’s main field. The opening ceremony included an exhibition of the youth mental health clinic, mental quality tests, the “To Be Number One” project of the Suan Prung Psychiatric Hospital, drugs and related paraphernalia from the Pha Muang Task Force, a physical efficiency test from the physical education department from the Rajabhat Institute, a sniffer dog show from 33rd Patrol police station, a Tae Kwan Do display from Wachiralai and Waranikul schools, and a para-motor show from the Chiang Mai Para-Motor Club. Football, volleyball and sepak takraw competitions are scheduled between April 21 and March 2. Twenty-six teams have already competed in basketball. The sports bonanza intends to give the participants the opportunity to display their talent and ability, encourage them to spend time beneficially, prevent them from taking drugs, and build up their health and sporting skills to prepare them to be provincial athletes who will compete in regional and national sporting competitions. The young sportsmen in football, volleyball, sepak takraw and basketball will compete for trophies in the final round at Rajabhat Institute’s football field and gymnasium on May 2 when the Summer Youth Sport closing ceremony will take place. It will be presided over by Assistant Professor Ruengdech Wonglar, rector of Rajabhat Institute. When I was six years old, my uncle Ira took me on my first roller coaster. The rickety little metal car seemed to take forever to make its slow way up the steep hill that rose above Coney Island Amusement Park. When I thought we could go no higher, and when the city of Brooklyn lay impossibly far below us, like a child’s toy, the break released, and we plummeted. The little car came tearing down the hill, sending our hearts to our throats. It was terrifying. I screamed. I cried. I prayed. When it was over, Uncle Ira asked me. “What did you think?” I was so shaken, that I could barely speak. “Let’s do it again.” I begged. We like to be scared, terrified, and exhilarated. Today, they call that near-death feeling and the tingling sensation in your right arm an adrenaline rush. 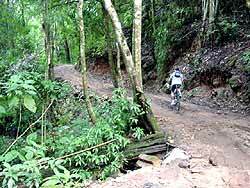 And if you’re an adrenaline junkie, luckily, Thailand has just the activity for you, off road, down hill, mountain biking. One of the wonderful things about living in Thailand is that the country is so well developed, in terms of infrastructure. Pretty much anywhere you want to go in Thailand there is a nice, paved road to take you there. So, I had never found any reason to take my lightweight racing bicycle “off road.” But for maniac off road mountain bike enthusiasts, like Aidan Schmer, of Siam Bicycle Adventure, going off road is more than just another option. It’s a way of life. “We do this every day,” said Aiden, referring to the four hour long off road bike tour he was planning to take me on. I was apprehensive when Aiden showed me the bike I would be riding. It seemed so high tech. I still remember when a ten speed bicycle, with fat tires, and a rigid steel frame, weighing forty pounds was the cutting edge of technology. All you had to do was put some baseball cards in the spokes, to make a motorcycle engine noise, and you would be the envy of all the other kids on the block. But apparently bicycles had grown up a lot since I was twelve years old. The bike Aiden showed me had shock-absorbers on the front fork, a huge spring under the saddle to cushion the ride, settings for rigid or flexible riding, twenty-four speeds with indexed gear shifters in the handle bars, and most importantly, breaks so powerful that they could stop the run-away inflation of the Brazilian economy. “Does it also make cappuccino?” I asked. From the way Aiden stressed that I shouldn’t toss the bicycle over the side of the mountain when I got frustrated, and I did get frustrated, I gleamed that these bikes were probably pretty expensive. But one of the advantages of going with a tour group is that they provide you with the bike. They also give you a helmet, eye-protection, and gloves. Additionally, tour companies can help you find the best routs to ride on, and provide you with transportation. Aiden picked me up at Rose Guesthouse, in an air-conditioned vehicle, and even stopped at Seven Eleven on the way to the tour. He made me pay for my own coffee, however. If only the bike had had that cappuccino attachment, I could have saved some money. As a road cyclist, doing a mountain, to me, usually meant cycling up a near vertical hill, straining and huffing. But for these off road guys, the only part of the mountain that interested them was the ride down. So, we drove all the way to the top of the mountain, and then had a class in bike handling. According to Aiden, the Master Yoda of bike riding, your body position and bike handling skills are the most important aspects of riding, to prevent injuries. The body position is actually a bit counter-intuitive, and may take some getting used to. But listen to the instructors, because they know what they are talking about. You’ll need to keep your body low and your weight back. Grip the saddle with your thighs. The reason why people fall is because their front tire turns, hitting the downward sloping trail at some angle other than dead on. Hold the handlebars firmly, but don’t lock your elbows or become rigid. Always use both breaks at the same time. Shift easily before hitting a hill, not after hitting it. Aiden alerted us to changes in the terrain, informing us when to change gears. When you encounter a stone, or some other obstacle, it is important to speed up; unnecessary breaking seemed to be one of the major causes of falls. 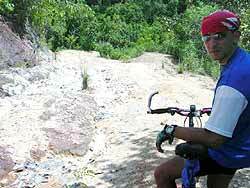 Look at the trail only a few meters ahead of you, not the person in front of you. Avoid deep sand or ruts. Always ride on the crown of a rut. When we finally started, I was so nervous. It was too much to remember. And the ride just seemed stupidly dangerous to me. Why would anyone want to risk falling off a bike? I wondered. Aiden stressed to me, a number of times, the importance of wearing a long-sleeved shirt. 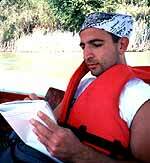 But, being a macho jungle man, adventure writer, wearing long-sleeved became a point of contention between us. In the end, I acquiesced, and I was glad that I had. Not ten minutes into the ride, I went right over the handlebars. I got cut a little on my right arm, but mostly my pride was hurt. Wearing a shirt prevented gravel from becoming imbedded in my skin. At that point I absolutely hated this failed suicide attempt, which these deranged persons had made into a sport. Around the next corner, there was a lookout where I could see the city of Chiang Mai a thousand feet below. The view was breathtaking. I relaxed a little, and my body position got better. When my body position got better, I developed more control. More control meant, less worry. Less worry meant more fun. Now I could begin to appreciate the natural beauty around me. There was bamboo and lychee growing right beside the trail. 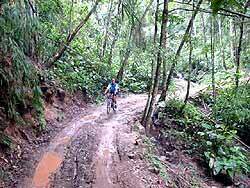 It was strange to find myself in the jungle, but rolling on two wheels. And, I was glad that I hadn’t put baseball cards in the spokes, because I was able to hear the song of the tropical birds, and the cicadas, whose constant drone reminded me of Tibetan monks, adding a note of exoticism to our folly. Of course, the goal of all down hill riders is speed. The better your control, the faster you can go. Barreling down that hill was like the roller coaster ride with my uncle Ira, so many years ago. But it was better. This wasn’t a ride in an amusement park. This was real life, and we were completely involved. The trip was unpredictable. Anything could happen. A stone or tree could jump out in front of you, and you had to react. It was much more like those race car games in an arcade. You had to stay alert, constantly shifting, changing, breaking and steering. It was exhausting. But in a strange meditative way, the deep attention forced you to be present in the moment. The time spent coming down that hill was time lived and experienced, not time that slipped away, unnoticed. And just like that roller coaster ride with my uncle Ira, it was over too soon. We reached the bottom, and pedaled home. “Can we go again?” I asked.